Article below as it originally appeared. I have only tested this method when upgrading from 6.5.0a Build 5224934 to Build 5310538, your experience from earlier 6.x versions may vary. I have been able to replicate a possible issue with the Xeon D 10GbE driver VIB after the upgrade, workaround completed, details below. There is also one report of a Xeon D 1GbE driver issue, he was able to recover by backing out. This is not official VMware documentation, it's merely a convenient upgrade technique that may help in lab tests, it's up to you to adhere to the backup-first advice detailed below. All the background story on how this easy ESXCLI upgrade method came about was covered in my earlier articles about updating 6.0 U2 and 6.5. If you're in production, beware, this code just came out today. This article is for the lab, where you may want to give this critical patch a try. Users of the free hypervisor and folks who can't download the GA Offline bundle now have a path forward as well, without needing to read TinkerTry's My VMware's "You either are not entitled or do not have permissions to download this product." error, and what to do about it. you can now continue with this simple approach to upgrading your lab environment. Unsupported, at your own risk, see the full disclaimer at below left. Turn on maintenance mode, or ensure you've set your ESXi host to automatically gracefully shutdown all VMs upon host reboot, or shutdown all the VMs gracefully that you care about, including VCSA. More details about the firewall here. If this command fails, you may want to try changing update to install, details below. Thanks Douglas! Wait time for the successful install depending mostly on the the speed of the ESXi's connection to the internet, and a little on the speed of the storage media that ESXi is installed on. If you have Xeon D X552/X557, to regain 10GbE driver VIB that works, consider using the easy one-liner fix described below. While I have not yet tested doing this before the reboot, Alastair did, and kindly left a comment below, noting that it worked fine. If you turned on maintenance mode earlier, remember to turn maintenance mode off. If you normally leave SSH access off, go ahead and disable it now. Type reboot and hit return (to restart your ESXi server), or use your favorite ESXi UI to restart the host. After the reboot is done, it would be a good idea to test login using ESXi host client, pointing your browser to the IP or hostname of your just-graded server, to be sure everthing seems to be working right. Special thanks to VMware ESXi Patch Tracker by Andreas Peetz at the VMware Front Experience Blog. This upgrade test was performed on a TinkerTry'd VMware HCL system. Yes, on both the very popular 8 core and the rather special 12 core version of the beloved Supermicro SuperServer SYS-5028D-TN4T system. Here's how my upgrade from 6.5.0a Build 5224529 to 6.5.0d Build 5310538 looked, right after the 1 minute download/patch. Yep, it worked! 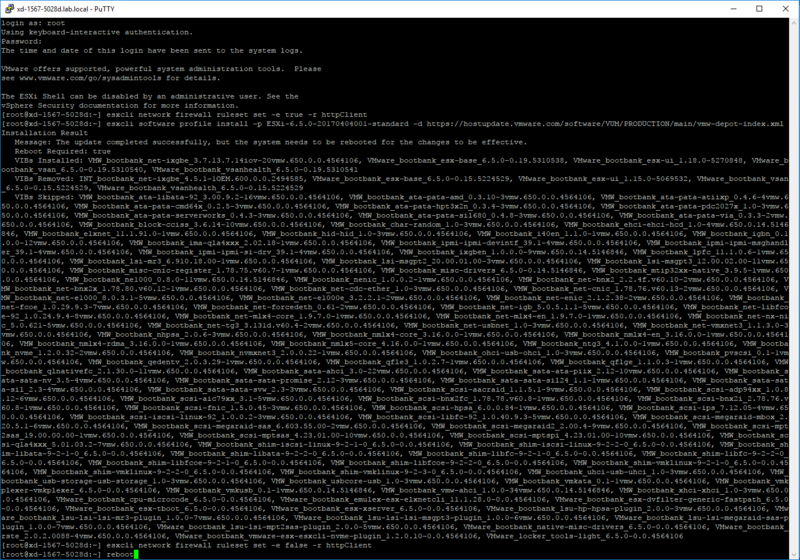 This is called the DCUI, using Supermicro's iKVM HTML5 UI to show you what my console looked like after the patch & reboot. 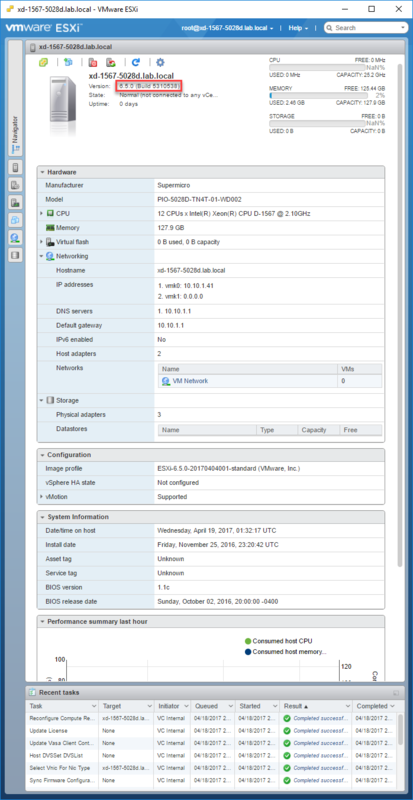 ESXi Host client view of Build 5310538. That's it! 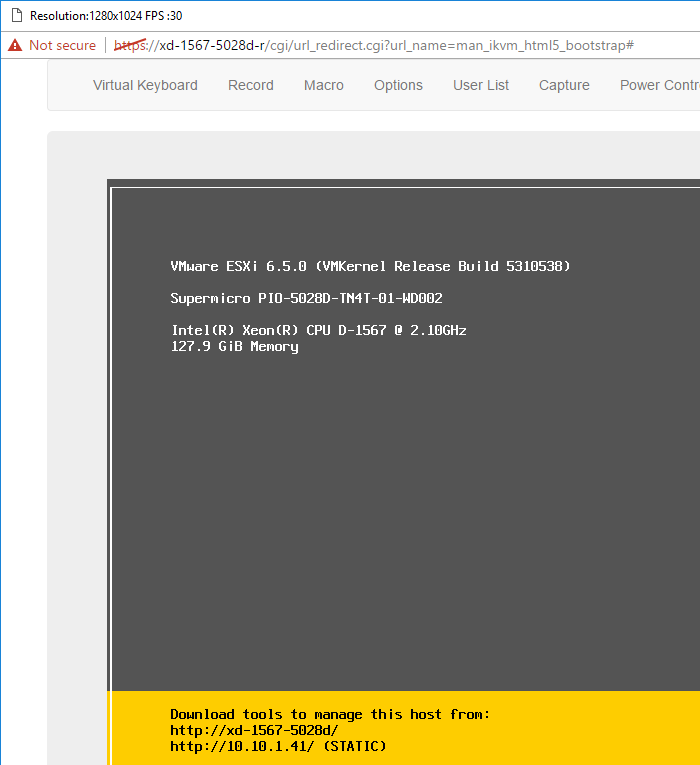 When the reboot is complete, you'll see for yourself that you now have the latest ESXi, Build 5310538, as pictured above. Now you have more spare time to read more TinkerTry articles! then you skipped the firewall configuration step above, try again! Message: Host is not changed. but simply changing from update to install worked for me, but your results may vary. See also the interesting comment below. Using the update parameter doesn't work, as seen above, but using install does. Click the image above to read the rest of the conversation thread. then rebooted. Everything working fine again. I haven't encountered this issue reported below, or been able to replicate it, but all the more reason to backup first. 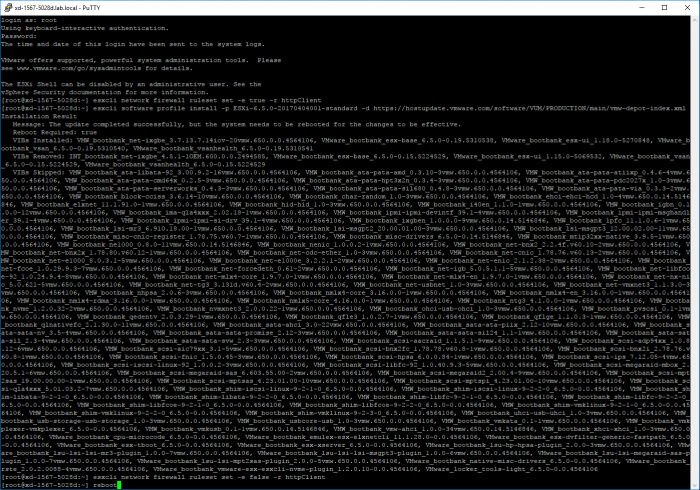 Alternatively, you could have used VMware Update Manager on a Windows system or VM, but for one-off upgrades typical in a small home lab, pasting these 3 lines of code is pretty darn easy. Looking ahead, since VUM is now built into VCSA 6.5, this will add another way to do future upgrades and patches, even in a small home lab environment. Two new comments from TinkerTry visitors Alastair Mackinlay and Askar Kopbayev have been incorporated into the article above. VMware vSphere Taskbar Shortcuts Unleashed - profile switcher isolated and uncluttered Chrome Browser UIs act like native Windows apps!